Today we just released an update for AltUnityTester (v. 1.2), a Unity3d plugin that enabled UI automation on games and apps developed in Unity. We plan to update the video tutorial soon to show how to use the new features. Until then, let us know how you find the new C# tests and using the Unity Editor! This is a great tool! 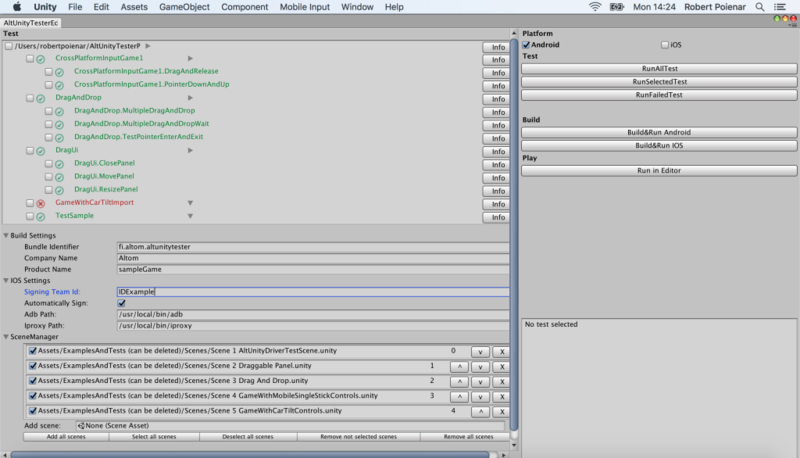 I love how easily it integrates with unity, and that tests can be written in C#. Thanks so much! Are there any forums to ask questions as development continues? v1.2 is really amazing. I had a confusion earlier that I thought I had to put the prefab in the scene like the old version, but the new version doesn’t need that. It is great, but I hope the next update can have a folder filter so it only shows the test created with it. For now it scans all the tests (unit test and all) in the Editor folders. And also, I had too guess what to put for calling object method and properties’ name. It turns out to be like this for example (“UnityEngine.UI.InputField”). Keep up the good work. This tool is really great! Thank you for the kind words, it’s great to know others find it useful! Your suggestions make a lot of sense and I will add them to the To Do list in Gitlab, they would definitely improve the user experience!